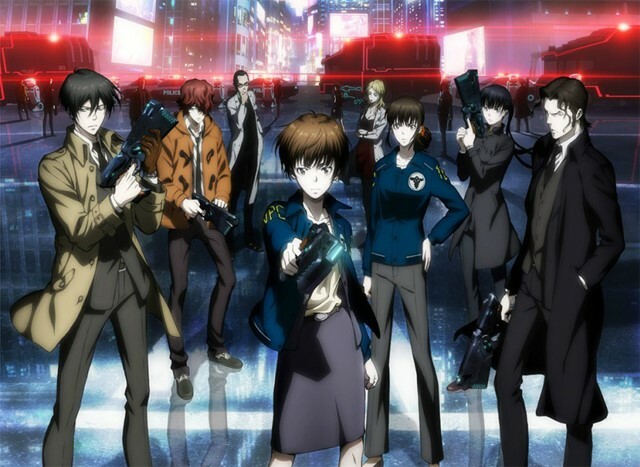 When the first season of “Psycho-Pass” came out, I enjoyed it, as it was a crime drama with a hinting of horror. When the second season came out, it was now a horror show, with a hinting of a crime drama. That changed the pitch of the show…..and badly. Nobuchika Ginoza (was an Inspector, now an Enforcer), Sho Hinakawa (new this year, Enforcer), Joji Saiga (seen last year, now being ‘rehabilitated’), Akane Tsunemori (now head of Division One), Shion Karanomori (another holdover, she is Data Analysis), Mika Shimotsuki (was a student last season, now an Inspector), Yayoi Kunizuka (another Enforcer holdover from last season) and Sakuya Togane (new Enforcer and very cloistered). The show came in with a great premise: What if you could keep you hue clear? You see, the Sibyl System rates a person by the color of their hue (or stress level). If it goes over 100, you are to be taken in to custody for ‘rehabilitation’. If it goes over 200, the only cure for that is death, as you are a real latent criminal. The Dominator, that gun they possess, can rate a person’s hue and will allow you to shoot it. If the hue is below 100, it will not let you fire it. But you, as an Inspector, can override the gun’s setting and allow you to stun the person, not kill them. For some odd reason, that aspect is absent, so we are treated to a lot of people being killed. And it’s not just getting shot and falling down dead. It causes some kind of chain reaction within your body, which causes you to blow up. Well, that’s not too smart. Think of the horrible mess it makes and since blood is considered a HazMat cleanup, that really creates more problems than you can imagine. And that’s the problem. It has now become a horror show, as these criminals do the most heinous acts of brutality and violence, but they cannot be shot. However, regular civilians are splattered across the countryside like bugs on a windshield. It takes a lot of conviction to get through the first five episodes, as these folks are rather trigger happy and have no qualms in leaving red spots everywhere. The show also harbors a lot of secrets, so something we see being done, like open insubordination, has a real overall reason that we are not yet privy to, as Kamui, the mysterious man who can help keep people clear, offers explanations as to why he does what he does. In some aspects, the horror angle works well on him, as we are only told of monstrous deeds and actions (and I feel there is never a real need to see the gore). In other aspects, when people are getting mowed down like bowling pins, it’s just there to make things messy and not really explain the actions behind it, save that the cops and their minions are complete homicidal maniacs. The actual ending is both strange and unsettling, and they could have easily taken out another two episodes to make it a full run AND help explain things a bit better, but this sets up the potential of a third season, which may wrap up the whole story line and the challenge the Sibyl System for what it has for humanity. And remember, it’s first run until you’ve seen it. Don’t point that at me.